Rabbit rescue organizations and wildlife centers get many calls about mother domestic rabbits not paying any attention to their young. People often intervene and feed the babies even though the mother is perfectly capable and already caring for her young. What most people don't realize is that the mother rabbit's milk is so nourishing that she only has to feed her babies ONCE in the middle of the night. The rest of the time she will act like she doesn't care for them. Therefore, you should not try to take over parenting the babies, and never EVER remove them. 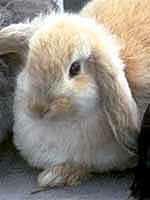 If your rabbit normally lives outdoors, keep her and her babies inside if possible, and keep the nest she made intact. Give the mother a lot of quiet time and privacy. If no nesting material is available, make a box with soft towels or shredded newspaper for the babies that will allow the mom to jump in and out. She will ignore them and only feed them once when you are sleeping. Make sure she has plenty of food and unlimited amounts of hay like timothy and oat hay, and some alfalfa for nourishment during this time. Get a syringe such as those used for babies sold at the local pharmacy or eyedropper. You could also get a baby kitten bottle. Point the tip of the syringe or bottle downward or towards the side of the mouth so if too much comes out, it goes on the towel, not down their lungs. Feed only two times a day (and this is only if the mother is not available for her young). Feed only in an upright position; go very slowly...a drop at a time and watch the baby to make sure that he licks and swallows before continuing. Do not overfeed, as more babies die from bloat and overfeeding when humans intervene. Feed KMR kitten formula or regular goat's milk found in your grocery milk section (you will need to shake the carton). Newborn - 1 week: Feed approximately 2 cc's per feeding (two feedings of 2 or 2 1/2 cc per feeding). Some rabbits may take a bit less or a bit more. Do not overfeed. 1-2 weeks: Two feedings of 6 cc's per feeding. 2-3 weeks: Two feedings of up to 12 cc's per feeding. Make sure to offer unlimited plain green rabbit pellets, fresh timothy and alfalfa hay and a water bottle. 3-6 weeks: Two feedings of up to 15 cc's per feeding. With newborns, it is necessary for you to stimulate their genital area after feeding with a warm moist towel to help them urinate and defecate after each feeding. Do this until their eyes are open. Wean them at 6 weeks. They should be eating pellets and hay on their own at 2 weeks. Put a water bottle also in the cage. Avoid feeding the babies any green vegetables until about 3 months of age. If ANY diarrhea occurs, remove all vegetables completely. Give alfalfa pellets unlimited to babies, as well as hay. It is very difficult to raise youngsters without the mom, so keeping them with the mom is best. Please spay and neuter parent rabbits once the babies are weaned.